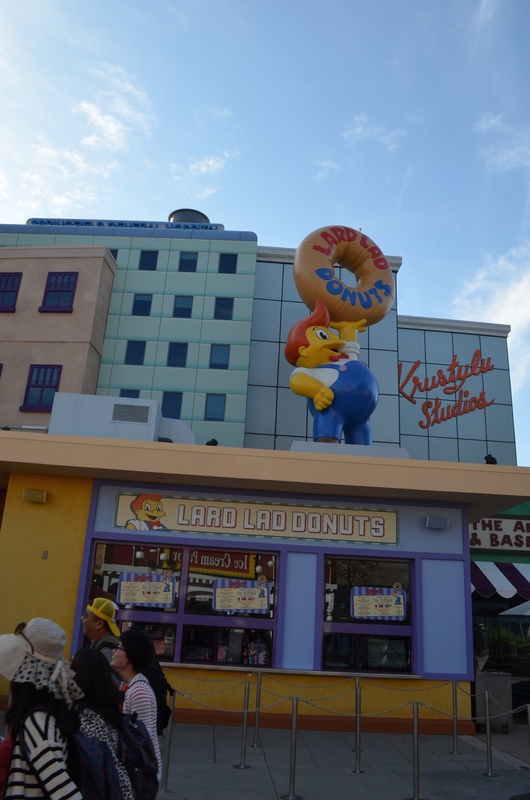 Springfield, home to the Simpsons, has recently opened at Universal Studios Hollywood. 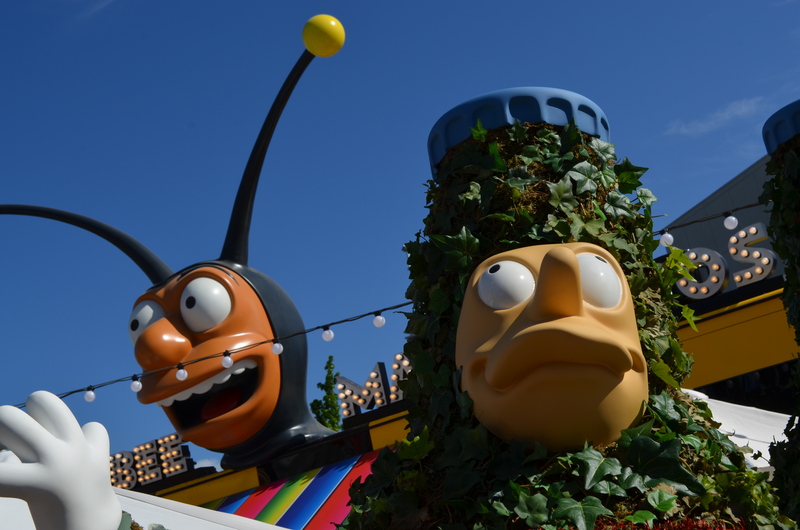 The characters have existed in the park since the Simpsons Ride opened in 2008. 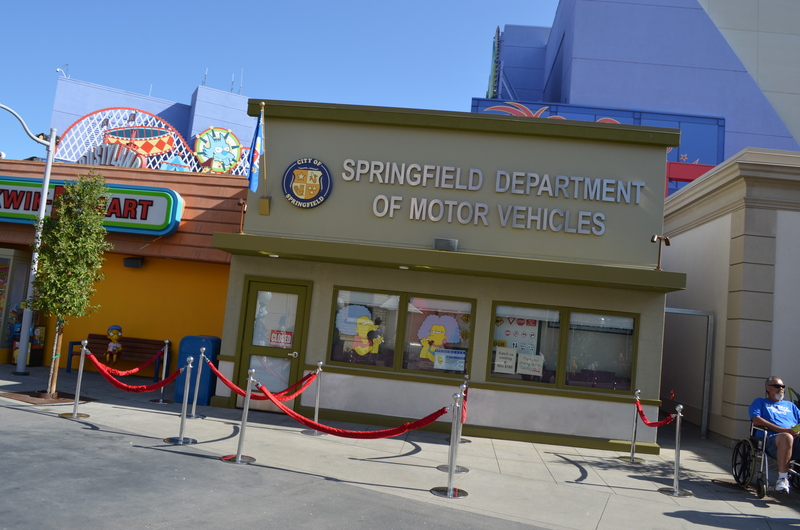 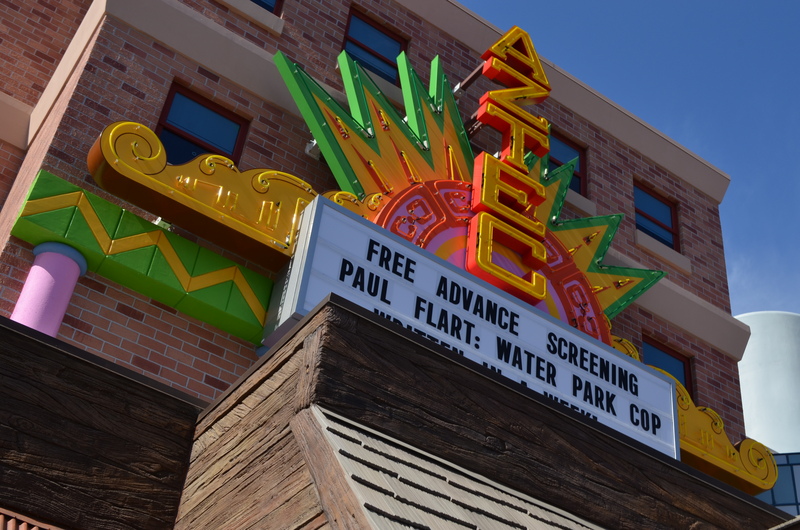 At the time, the surrounding area was known as Simpson’s Plaza and featured the ride and a good shop from the series, The Kwiki Mart. 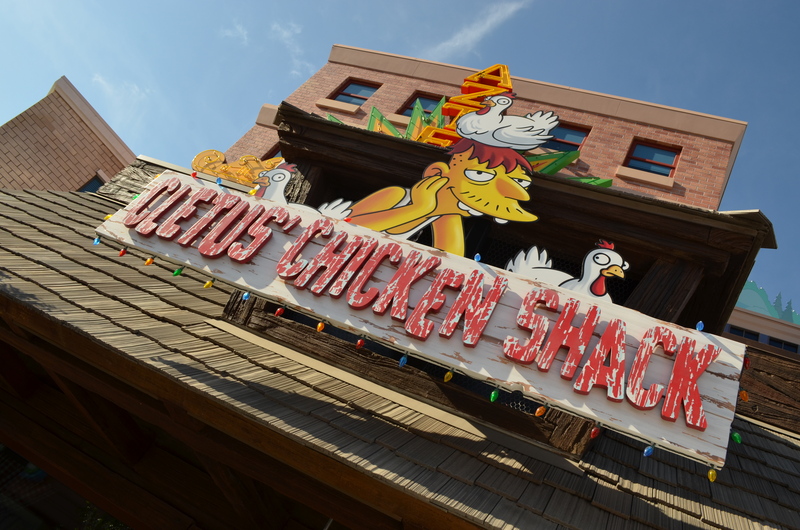 The adjacent buildings were various food and dining areas, such as the beloved Doc Brown’s Chicken. 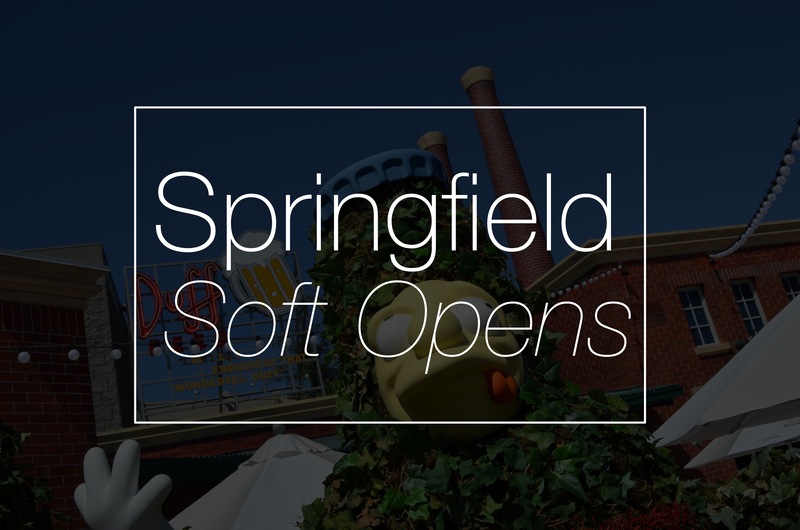 In early 2014, those adjacent shops and restaurants were closed and quickly demolished and in the short time frame of 15 months, Springfield took its place. 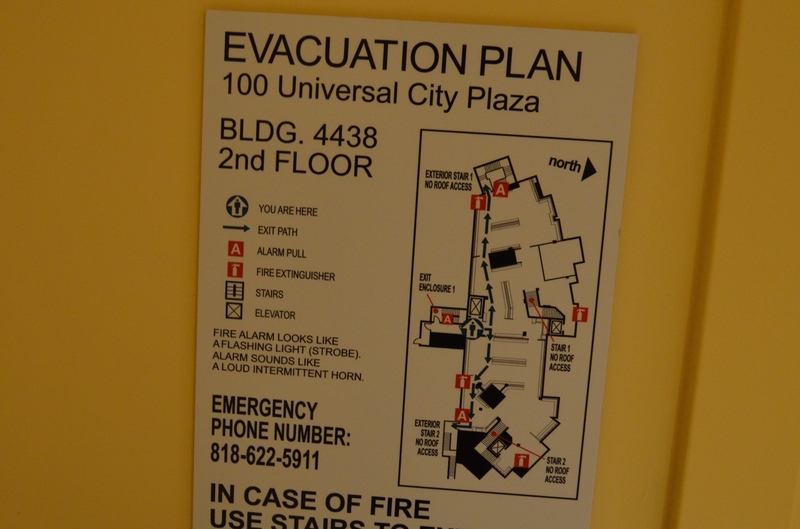 Here are the building’s fire maps to help orient yourself through they food court. 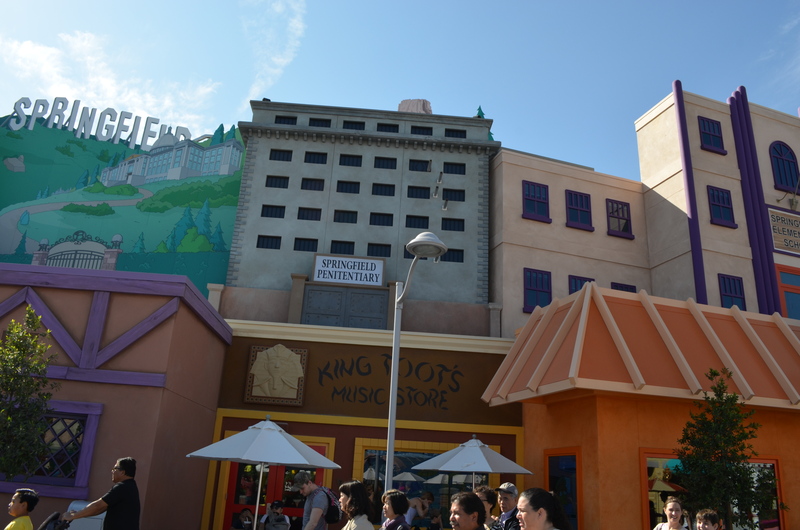 The main building of Springfield is the new, two story food court. 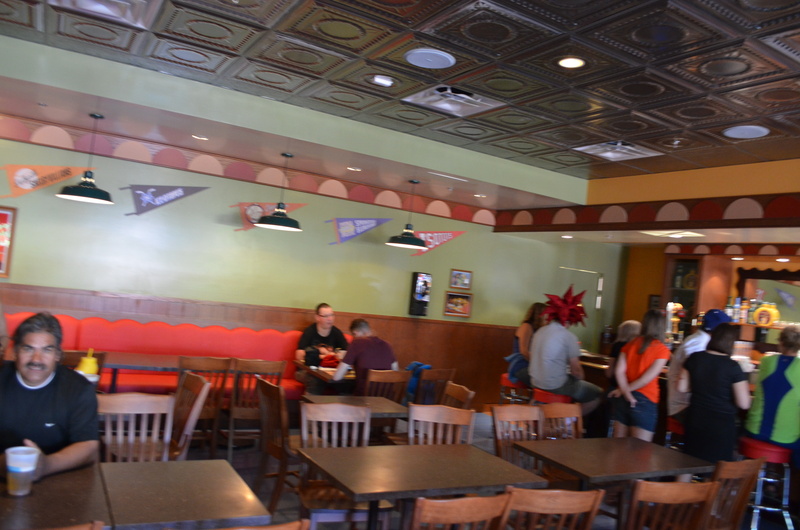 The north side is home to some other dining locations in a refurbished venue. 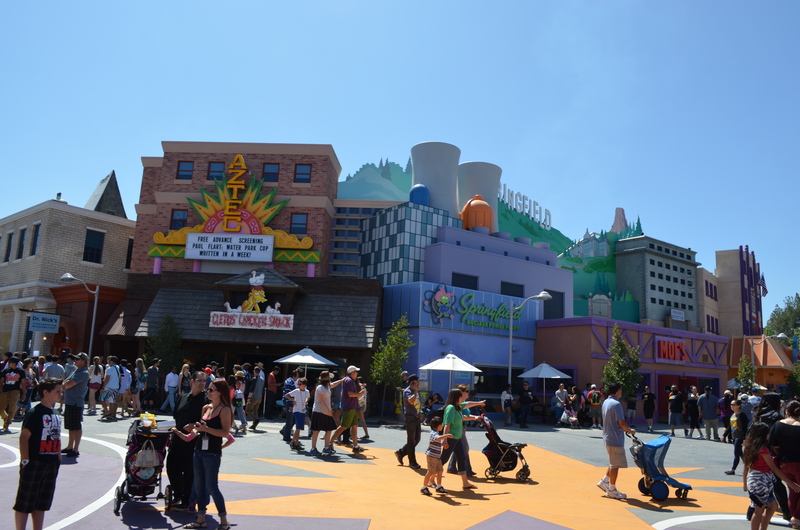 The main building’s two level design is disguised with multiple iconic facades from the series. 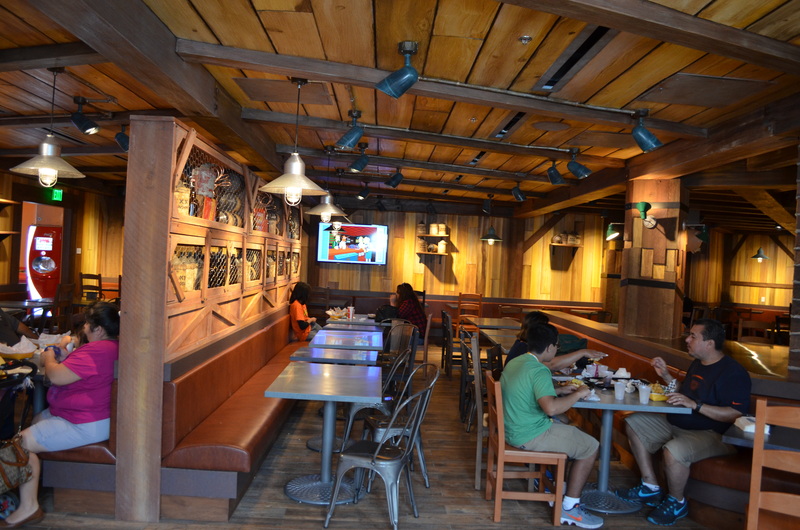 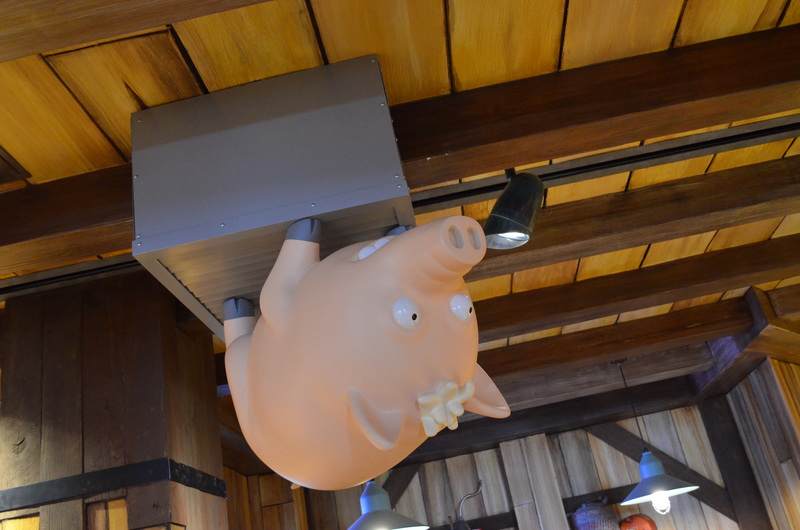 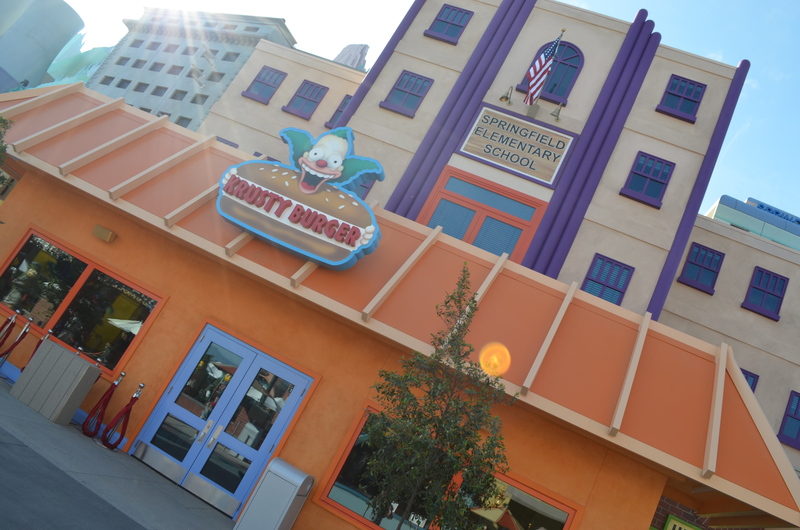 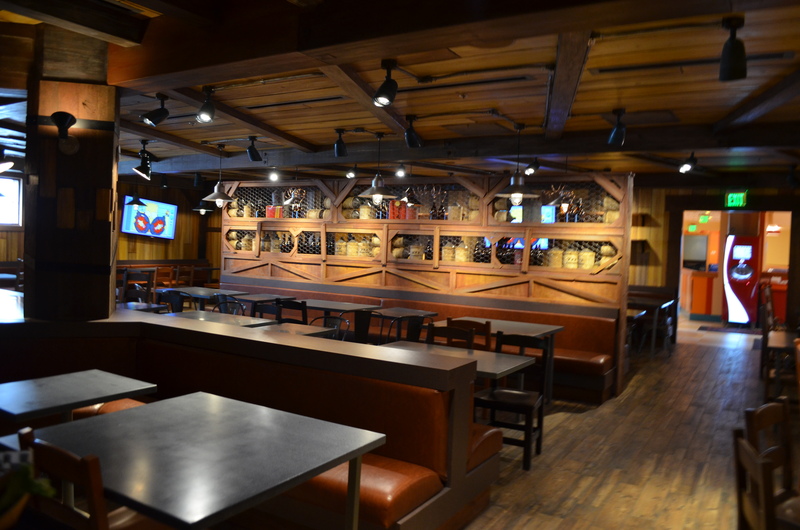 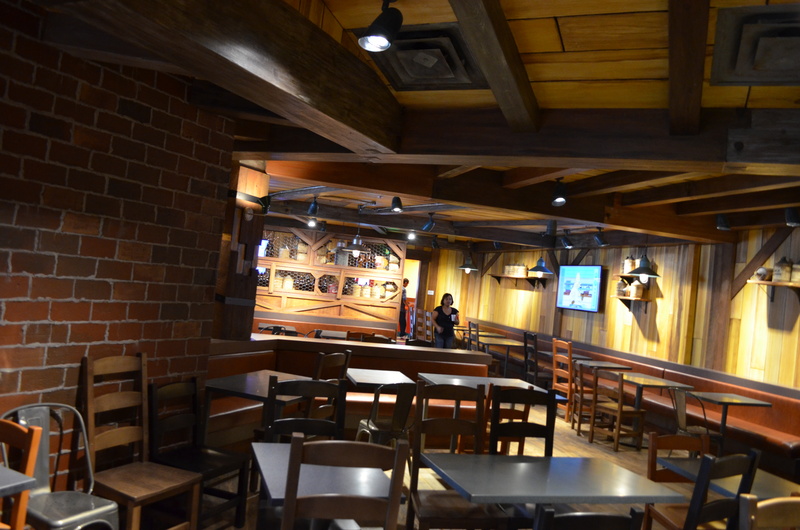 Krusty Burger and Cletus’ Chicken Shack are the two dining venues in the building and Moe’s Tavern is the fully themed bar. 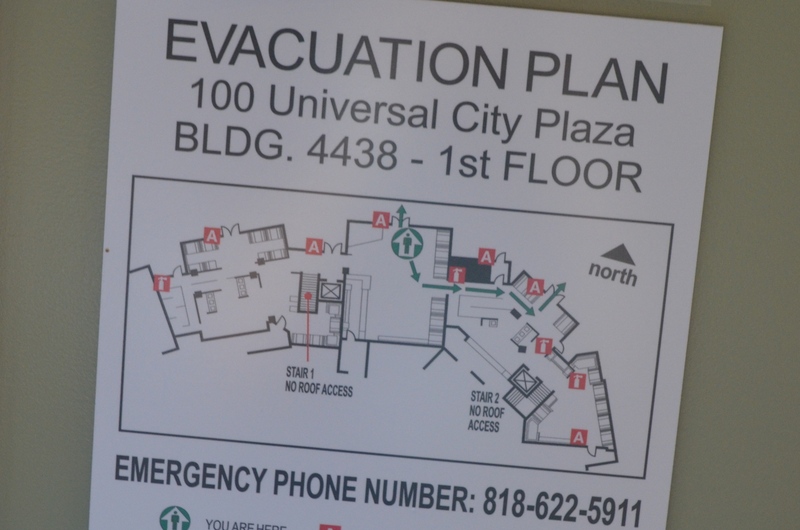 All of those venues are connected on the ground floor. 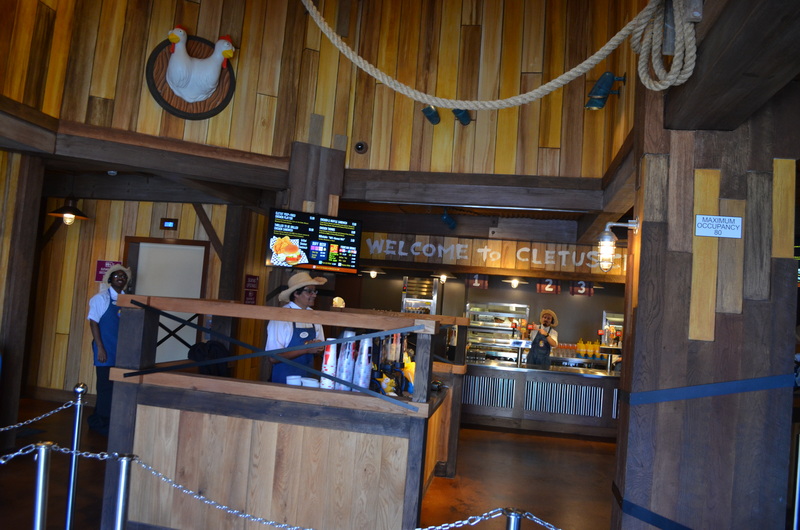 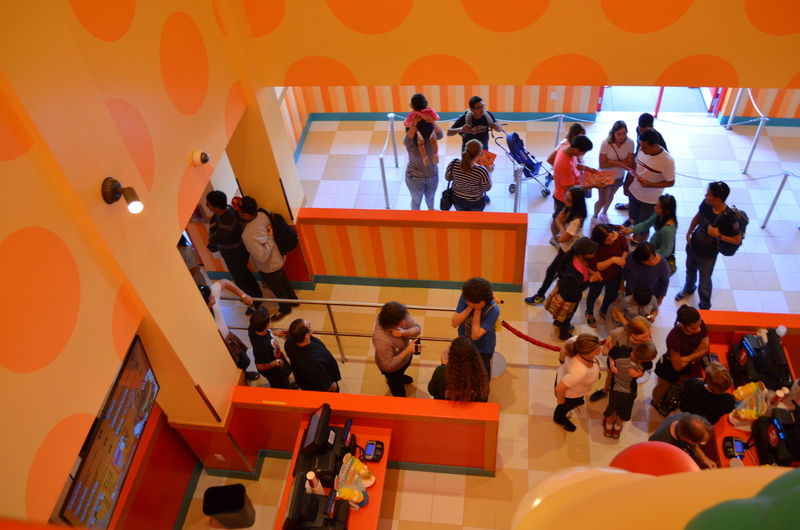 Once you enter Cletus’ Chicken Shack or Krusty Burger, a small queuing area greats you and you then make your order and wait for you number to be called. 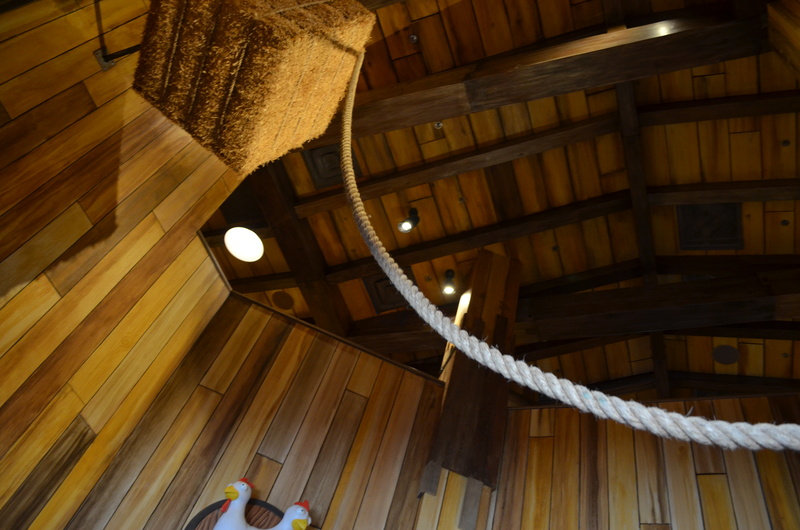 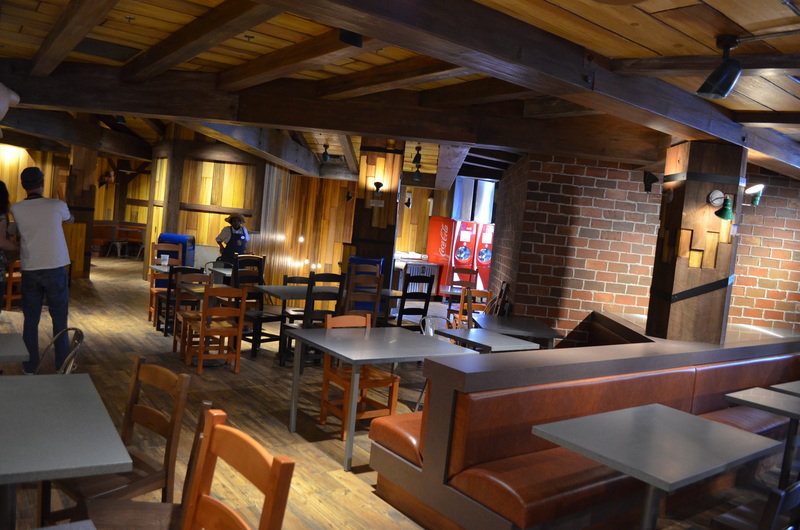 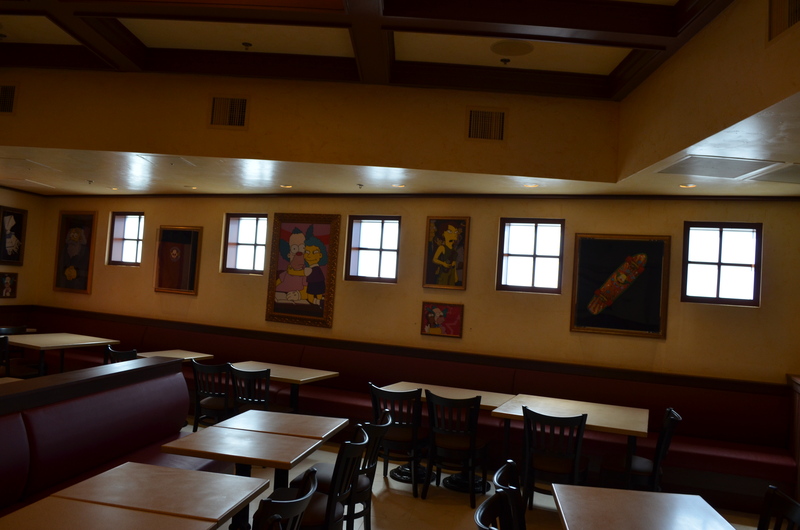 There is a small amount of dining on the ground floor, but the second floor is comprised of three themed rooms. 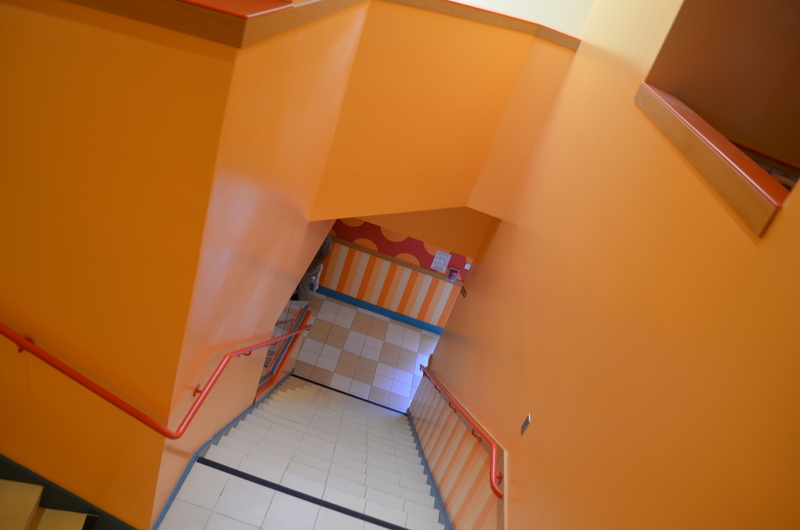 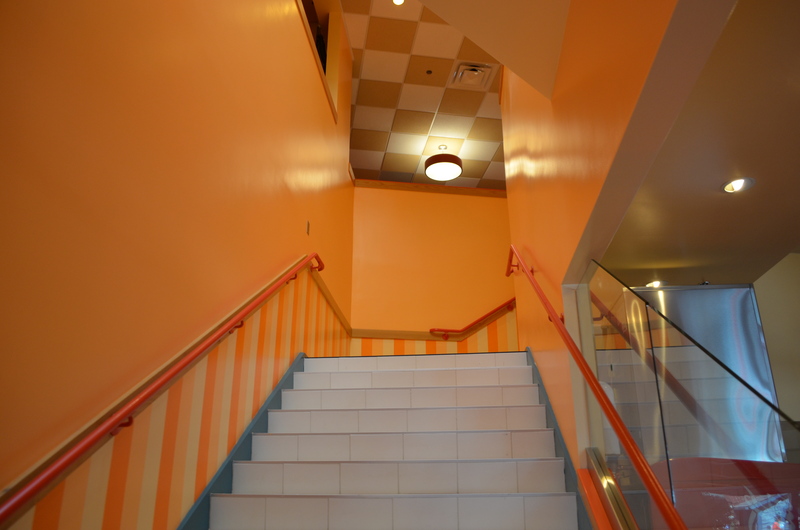 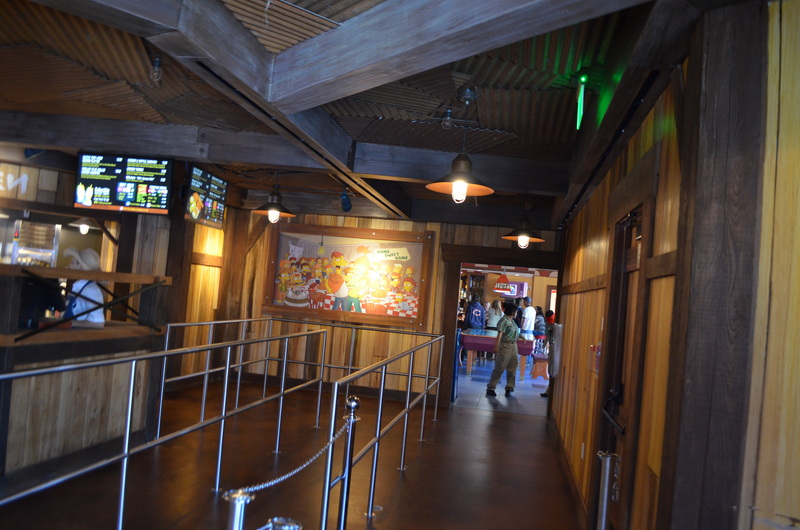 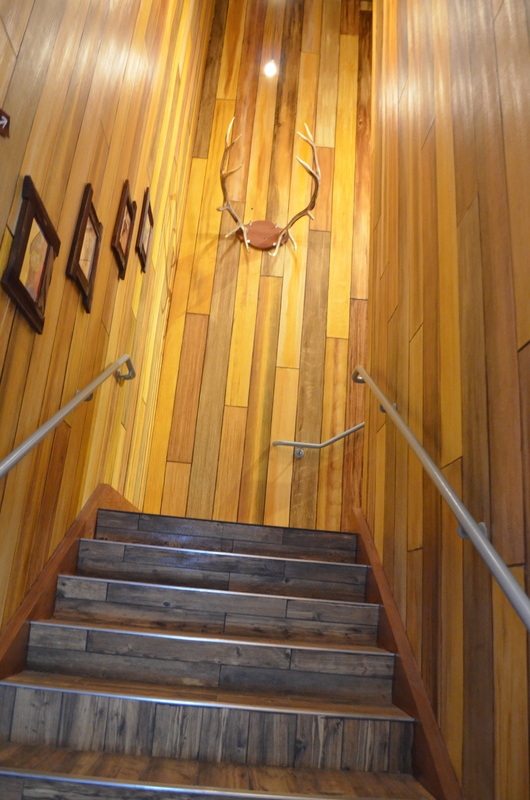 Stairs in Cletus’ and Krusty Burger take guests upstairs. 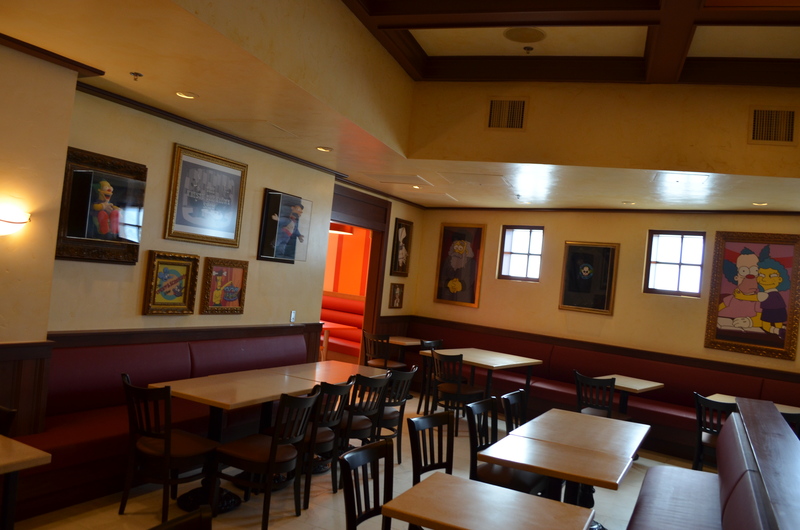 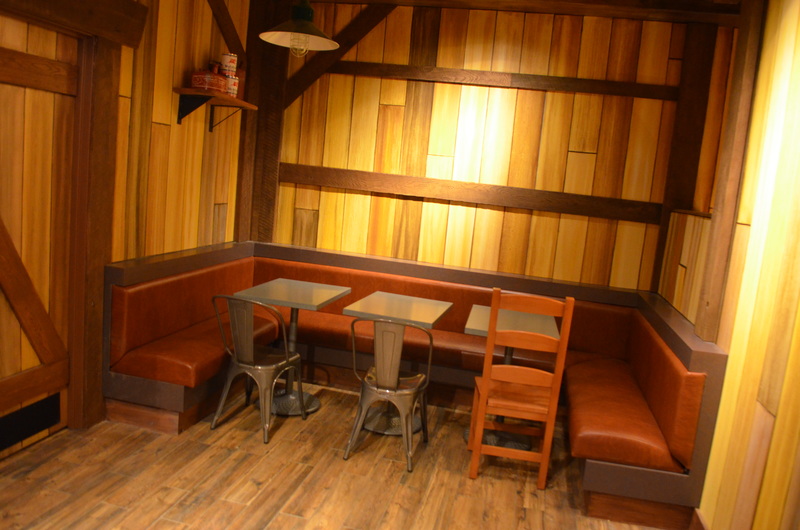 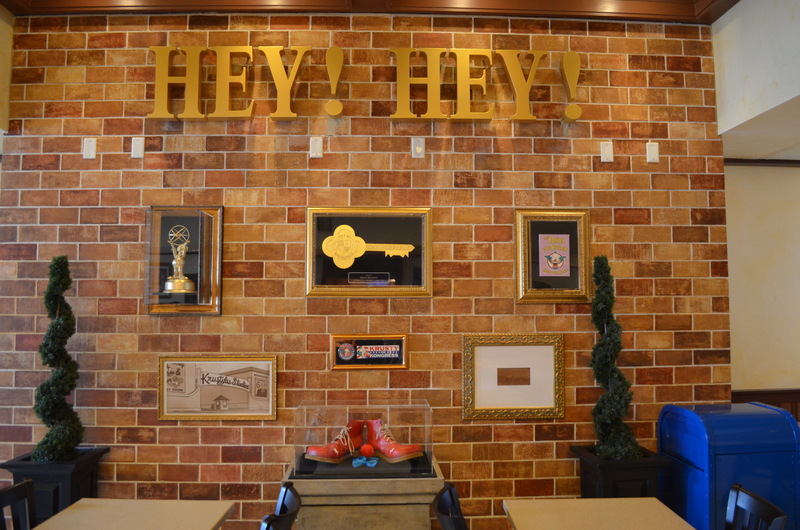 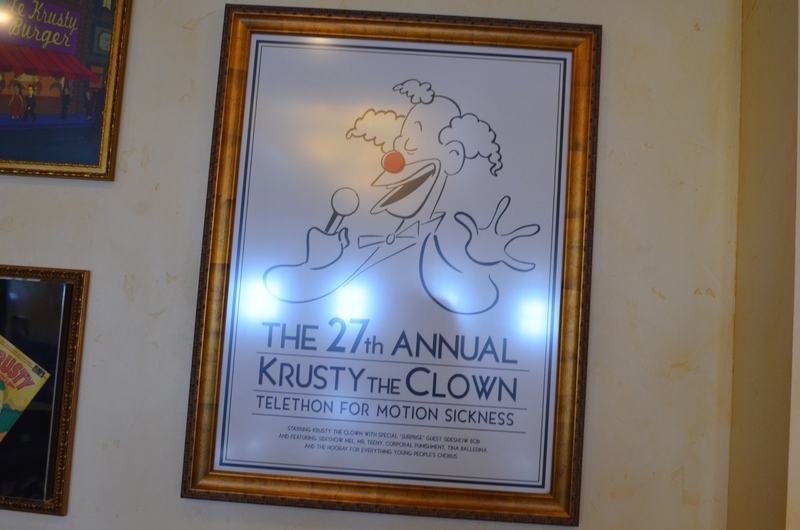 Two of the rooms are themed to those restaurants, and the third is themed to the Krustly Lu’ Studios lounge. 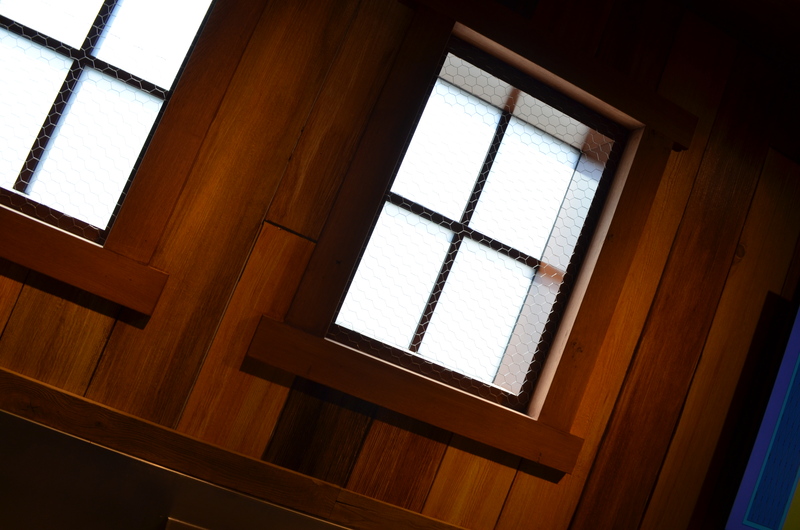 There are no windows over looking the streets of Springfield, but small frosted windows are located in the back of each room. 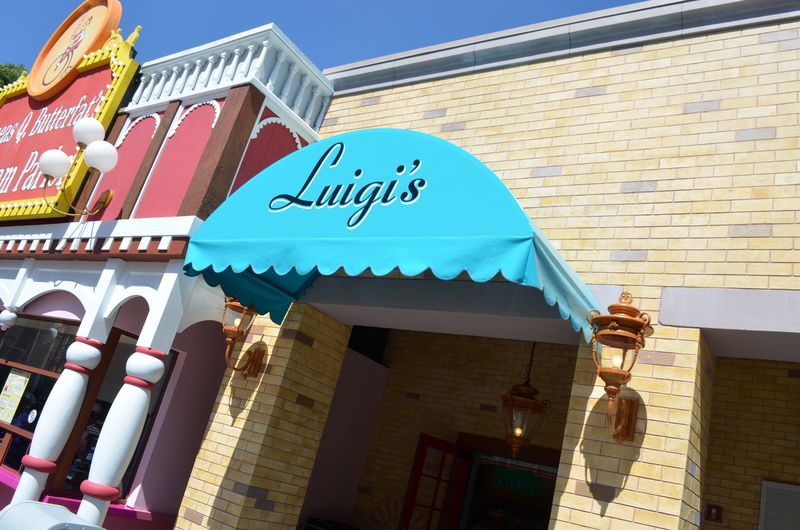 Each of these themed restaurants and dining rooms are wonderful and so immersive, you forget you are in the theme park. 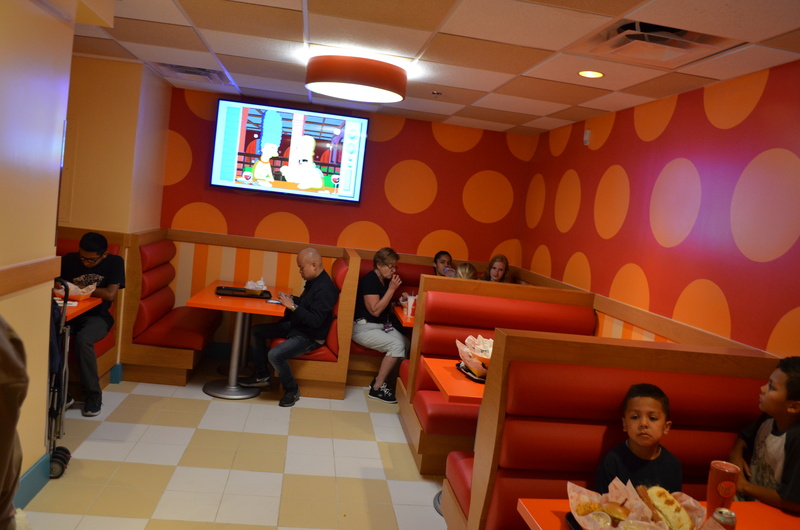 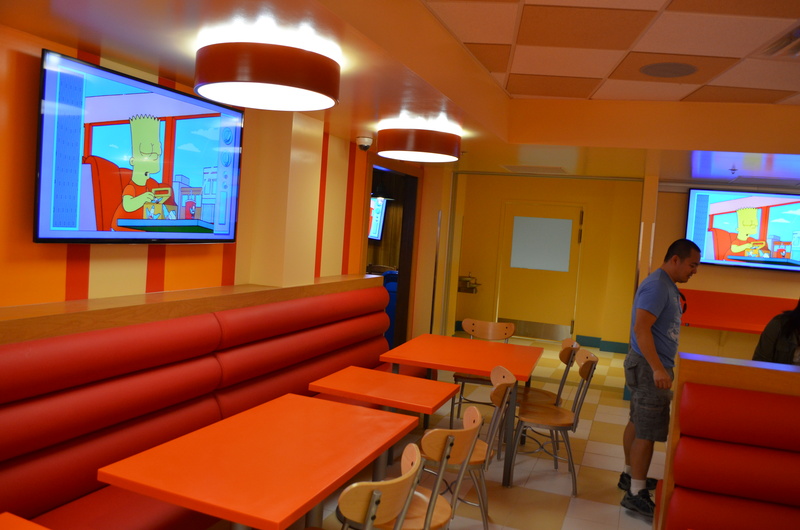 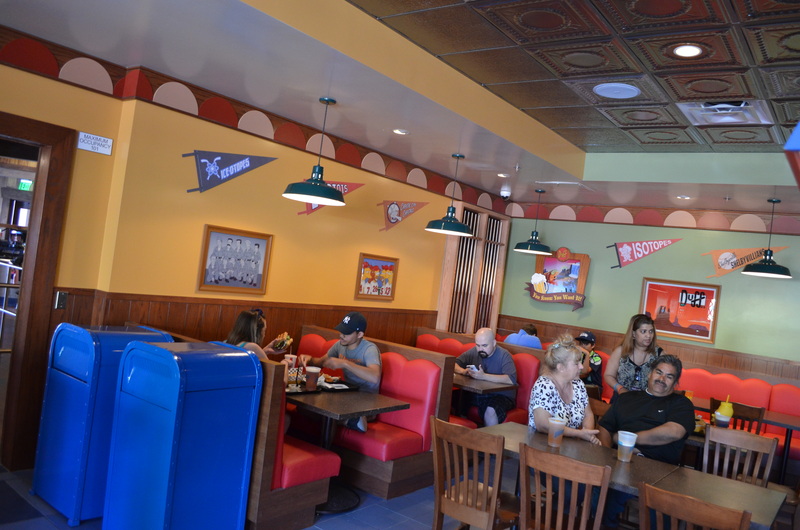 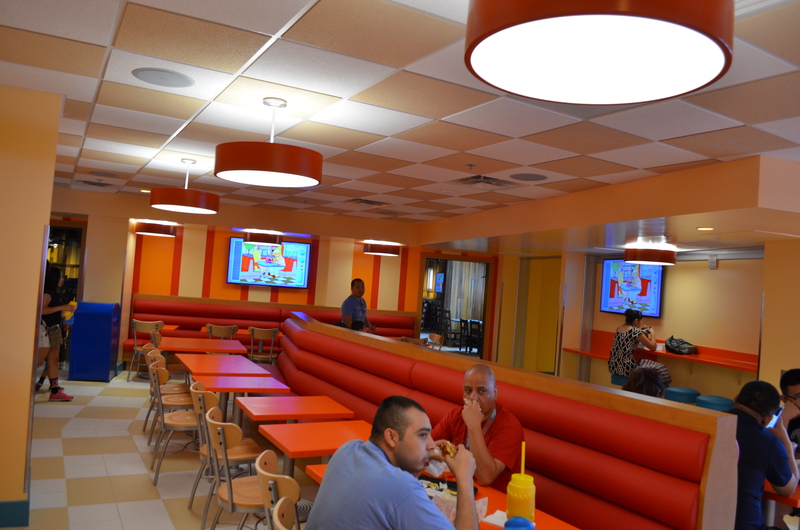 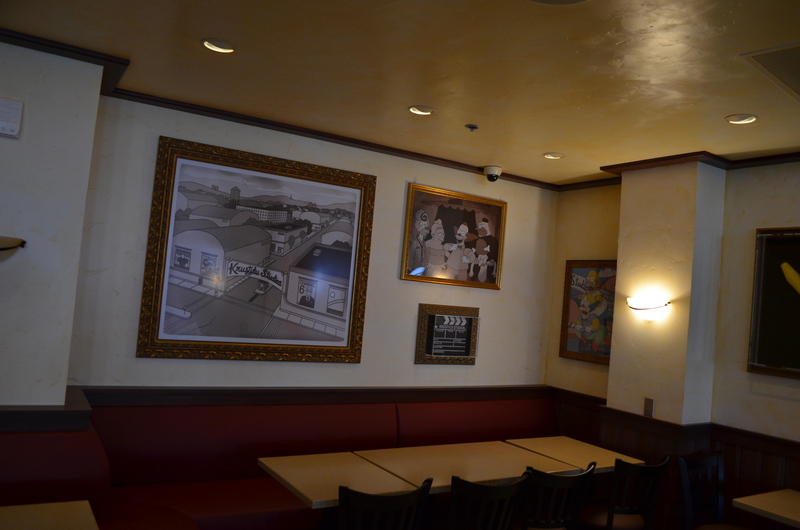 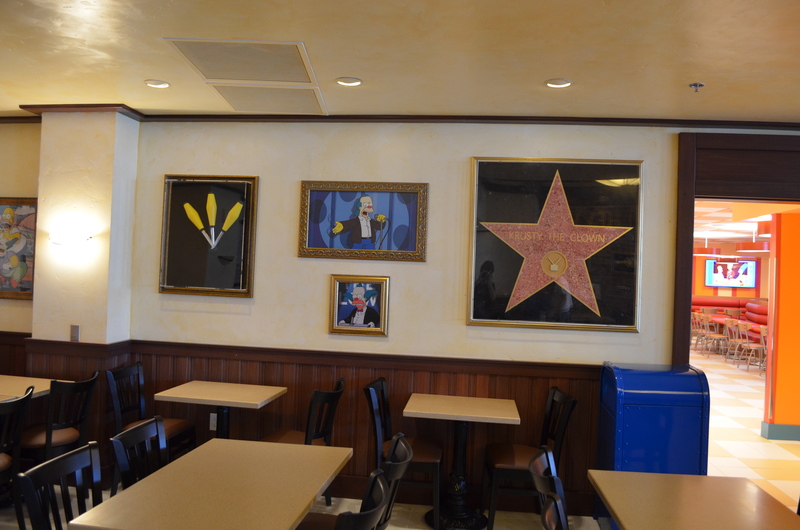 This section of the restaurants is the lesser themed of the two, more of a generic fast food look, but video monitors play a long look of Simpsons clips to keep you entertained. 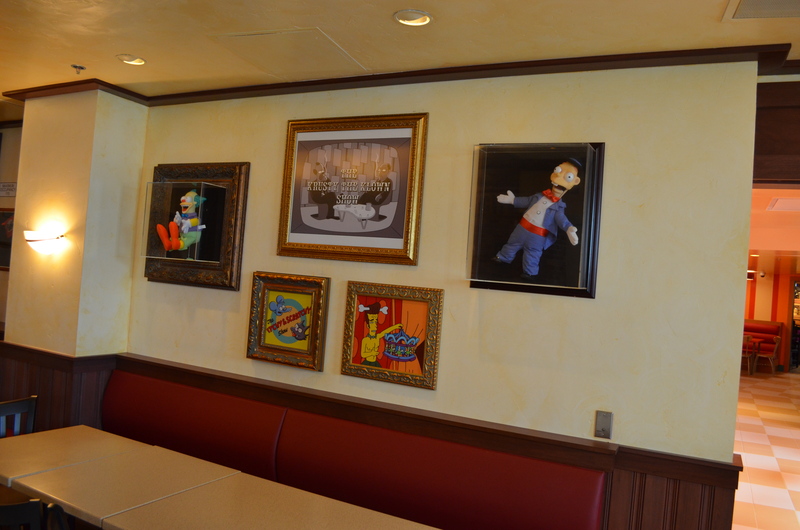 And finally, the highly themed Krustly Lu Studios room. 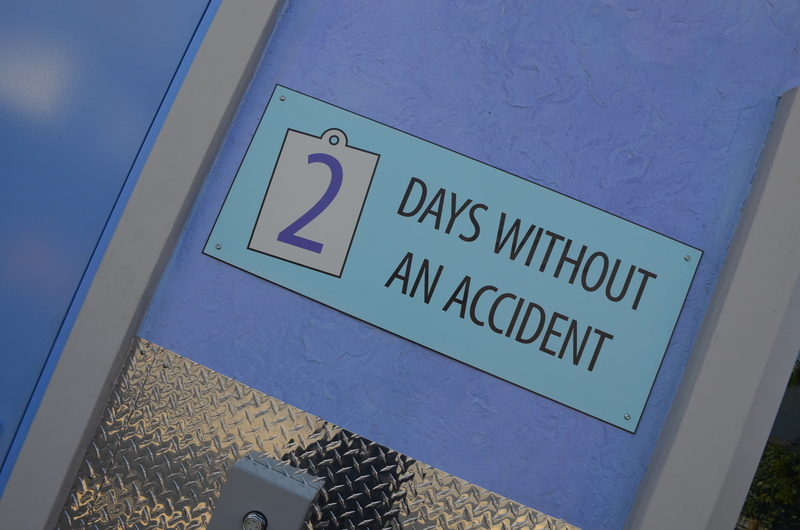 Seems as if Universal Creative is mocking themselves with their constant use of screens. 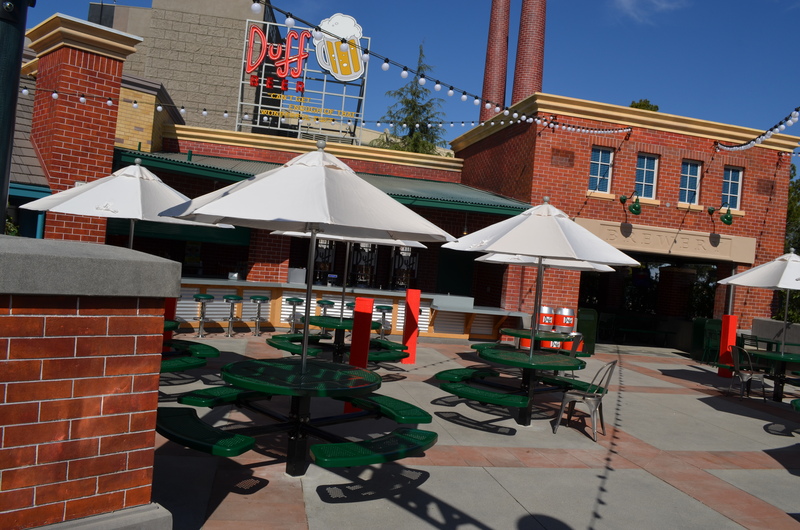 When we went to the park, we tried food from the two main venues. 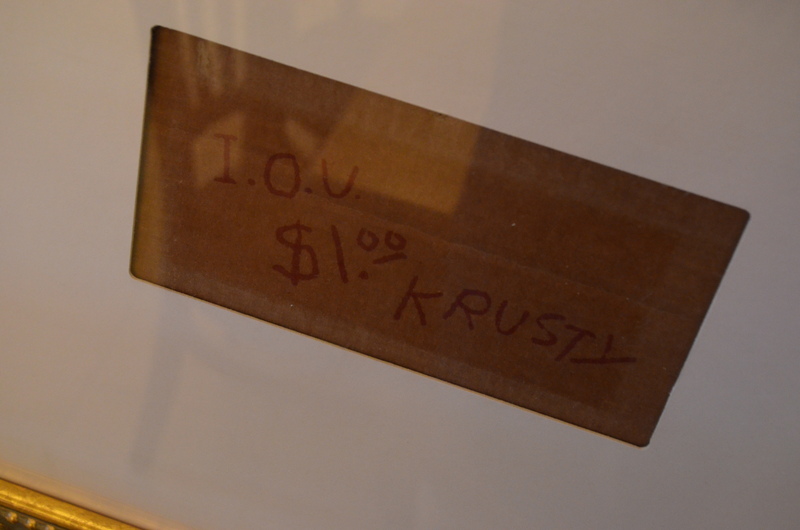 The Krusty Burger was really good. 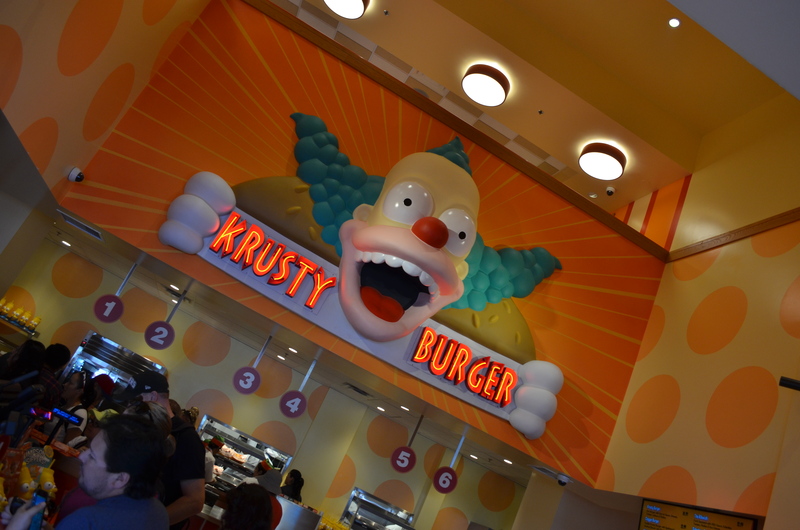 Definitely surprising for theme park food, it was one of the better burgers we’ve had. 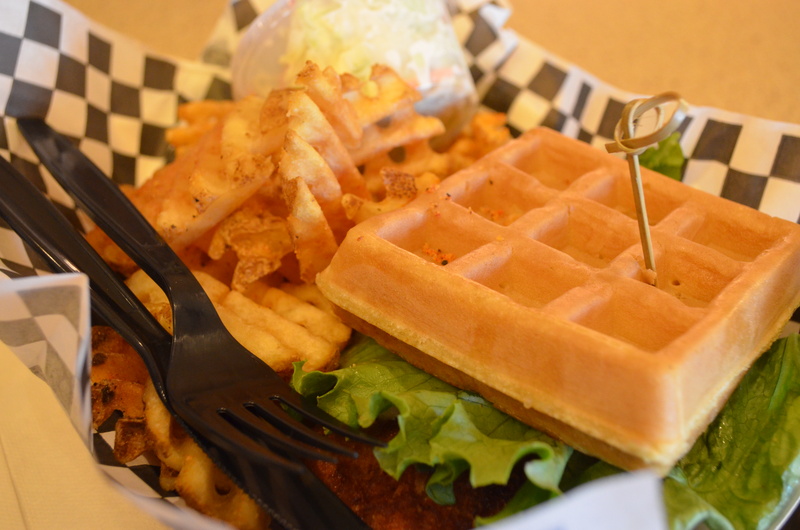 The Chicken & Waffle Sandwich was one of the best sandwiches I’ve ever had. 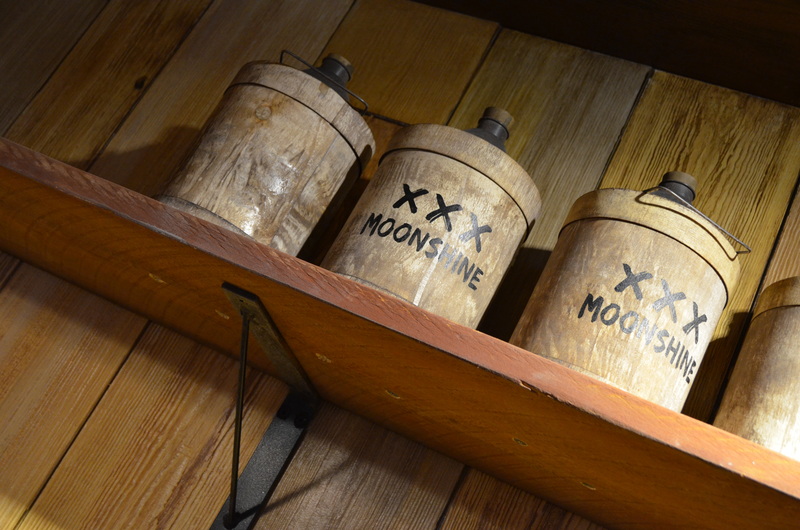 The sweat syrup sauce needs to be sold in bottles, it’s that good! 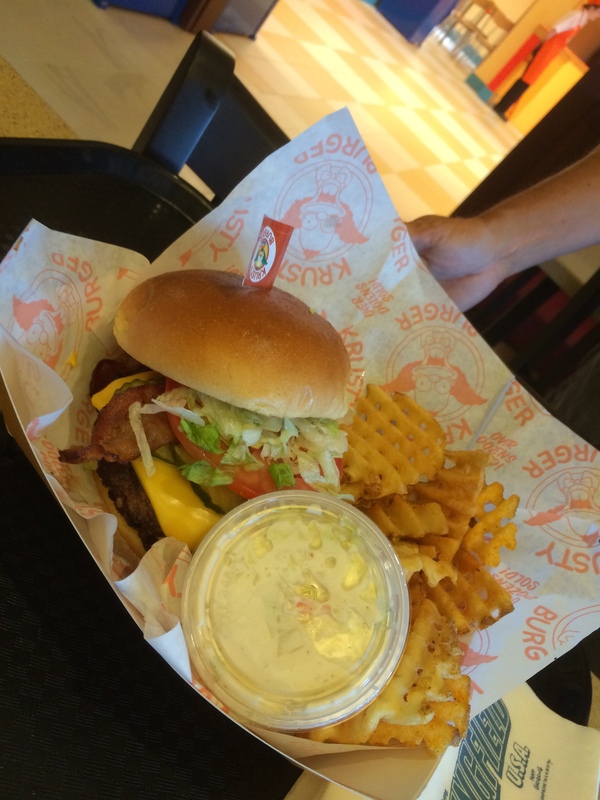 On the other hand, the waffle cut fries were rock hard and were practically uneatable. 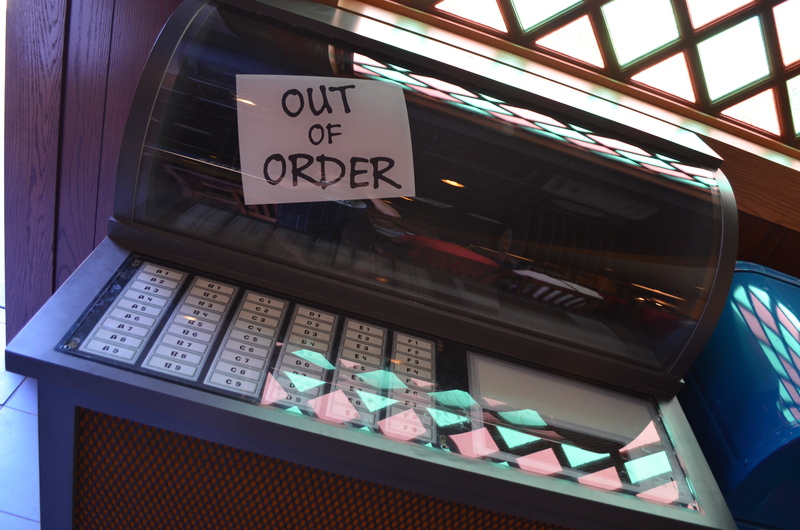 Hopefully they will be improved soon. 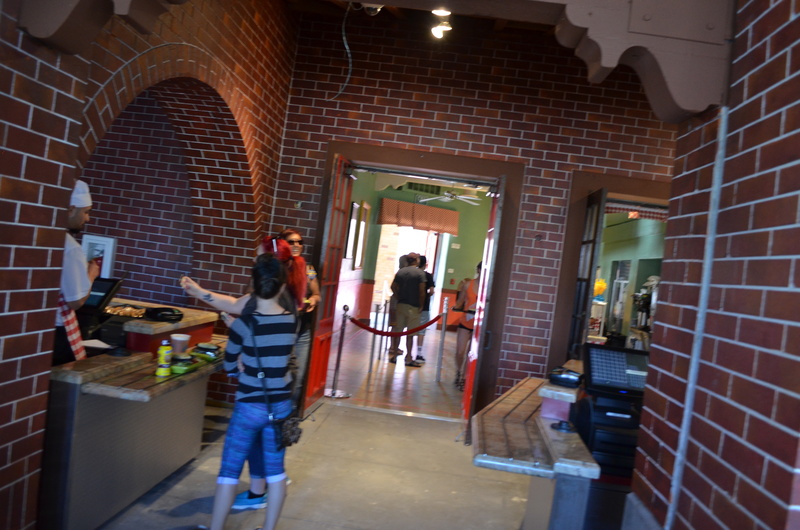 Inside the building are multiple Coke Freestyle machines for refills, so you wont need to go back to the first floor for refills. 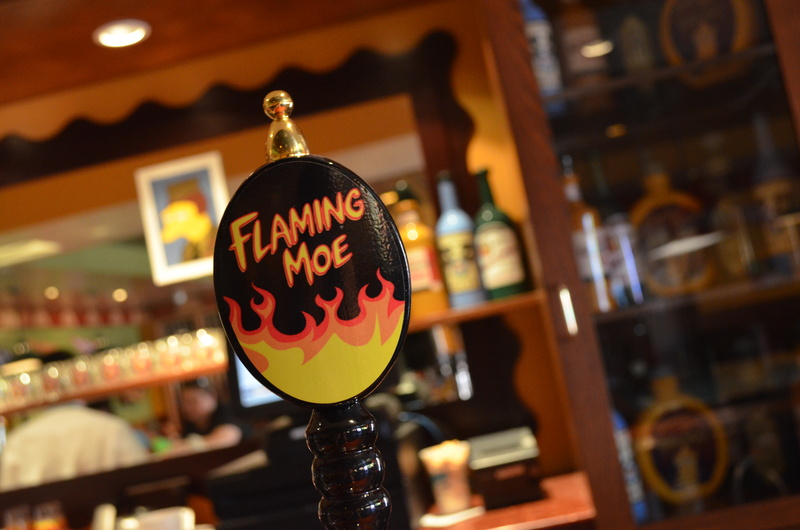 On the ground floor is Moe’s Tavern. 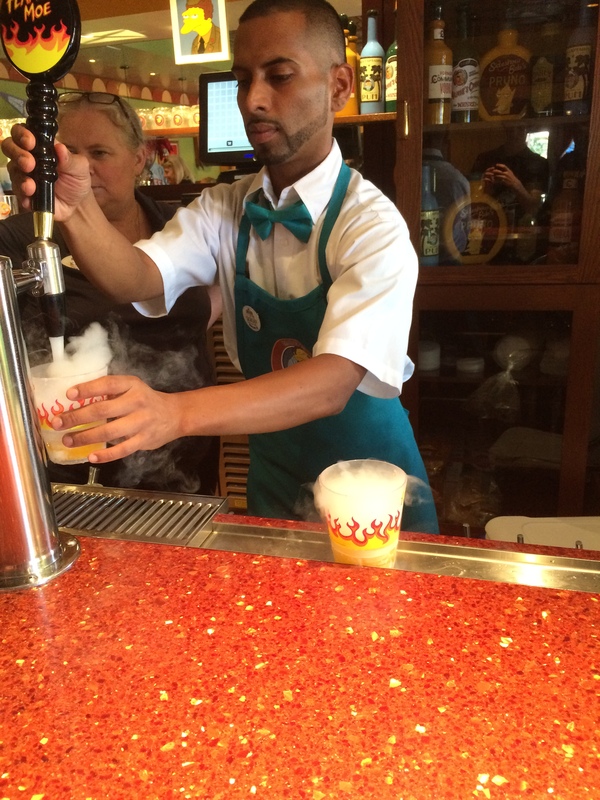 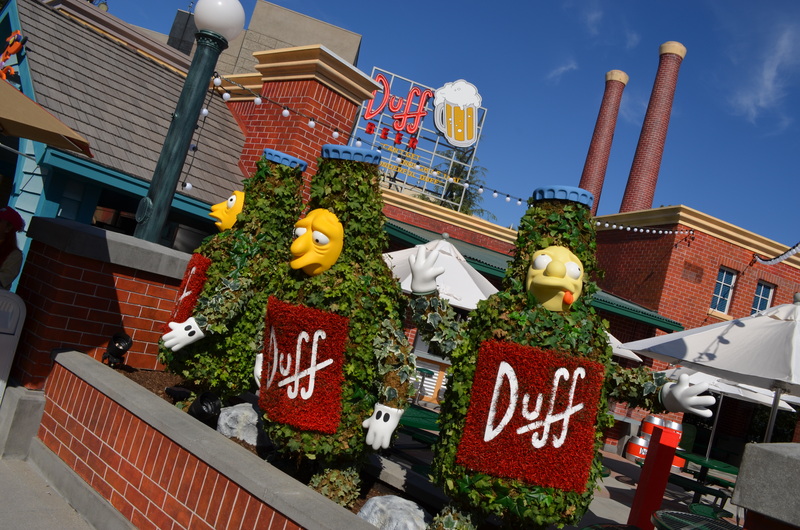 Here you can enjoy a Duff Beer or a Flaming Moe. 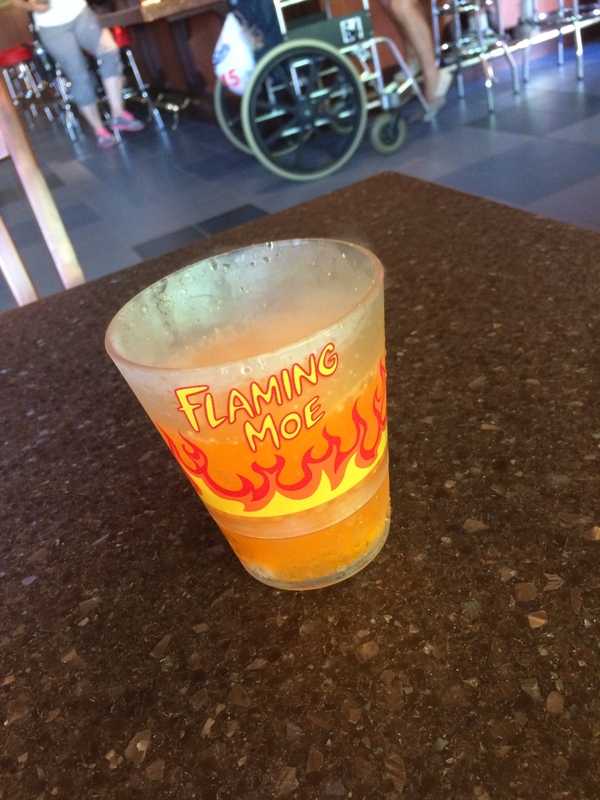 The Flaming Moe is a Fanta soda drink in with dry ice in a souvenir cup, but at $9 its really expansive for the size of the drink. 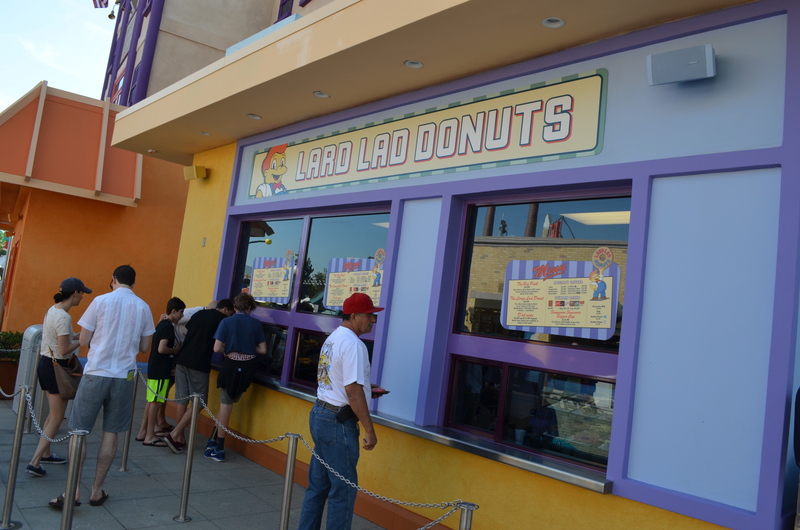 There is a small amount of outdoor seating for guests dining in those restaurants and the nearby Lard Lads Donuts. 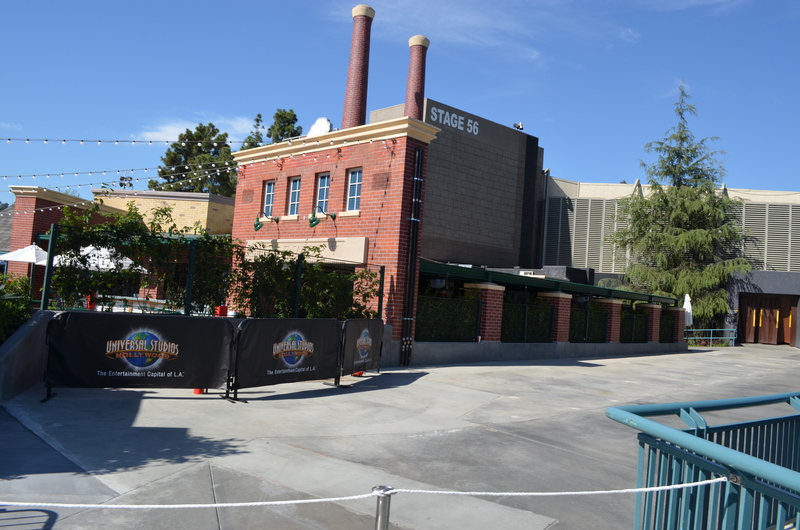 Across the street are five venues. 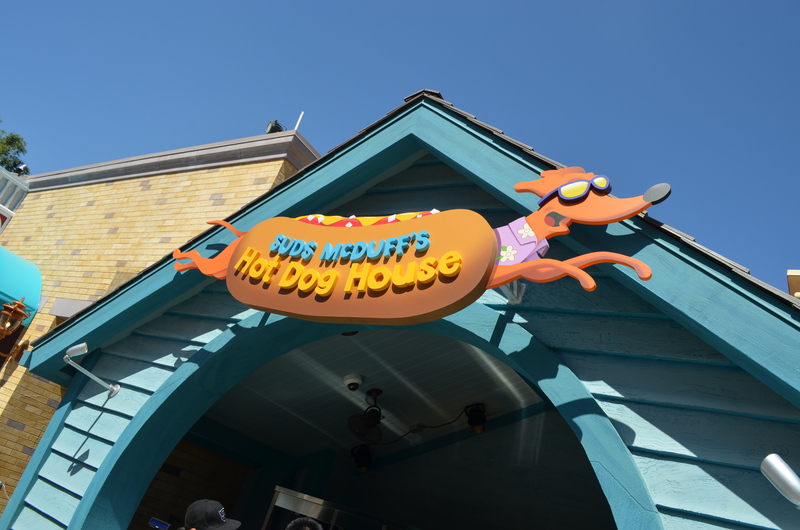 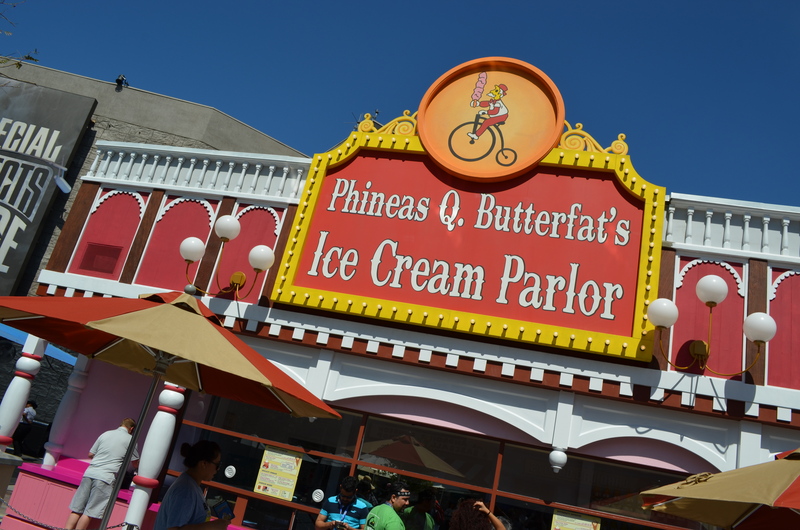 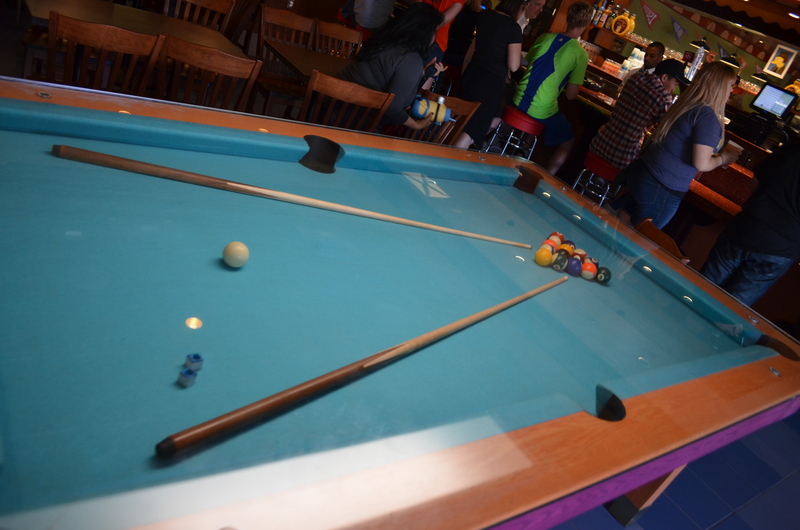 Phineas Q. Butterfat’s Ice Cream, Luigi’s Pizza, Suds McDuff’s Hot Dogs and Duff Brewery are located in a heavily remodeled food location. 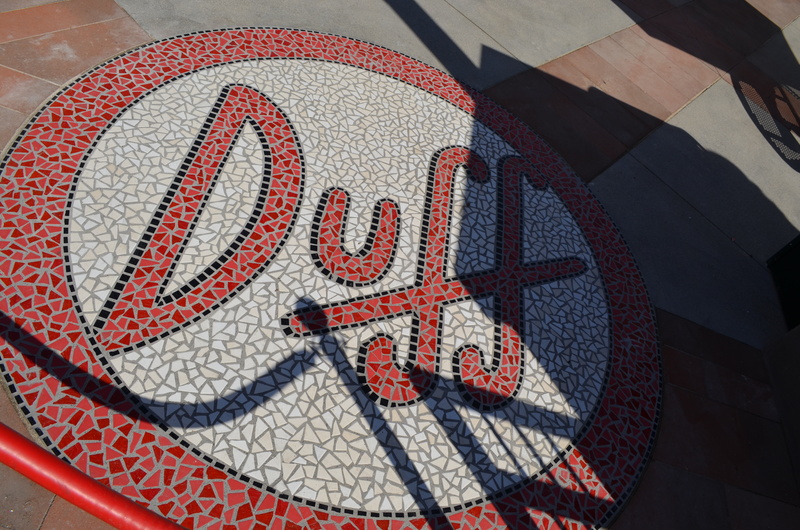 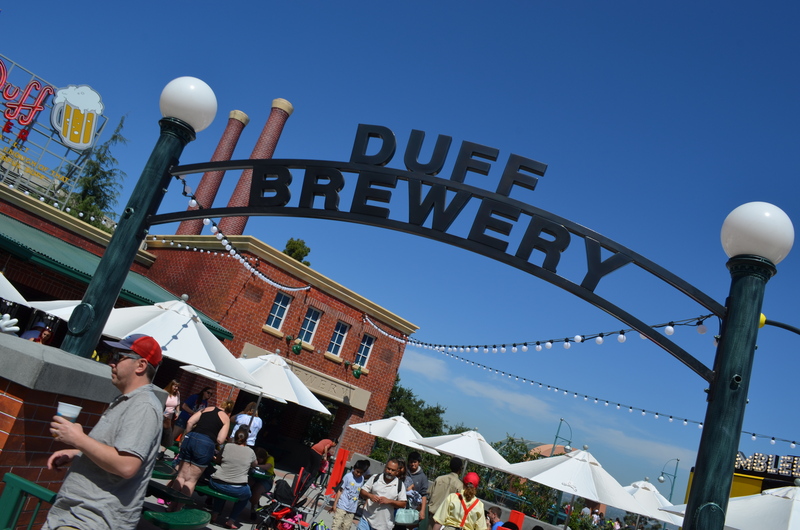 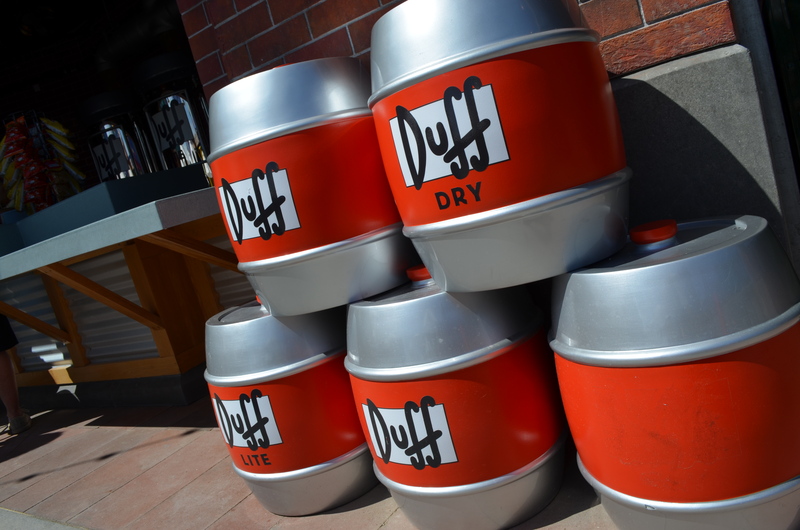 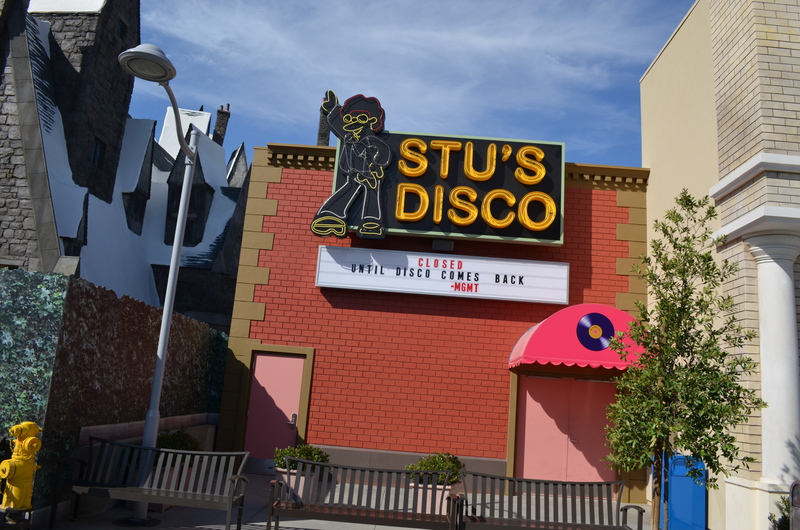 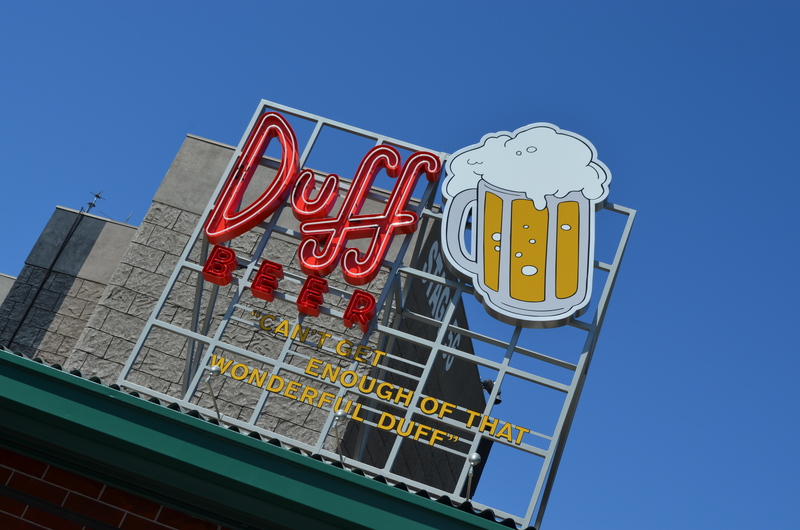 The Duff Brewery is located in the Duff Beer Garden, also home to the Bumblebee Man’s Taco Truck. 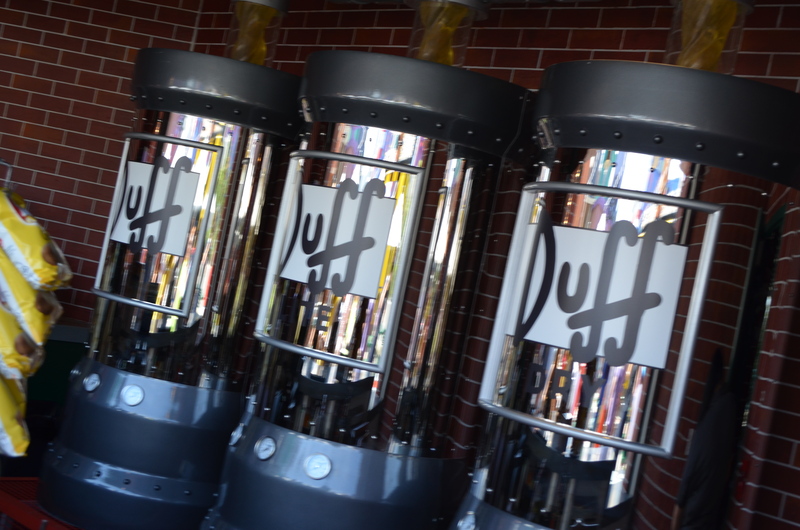 The ‘Seven Duffs’ are adorning the small planter at the beer garden’s entrance. 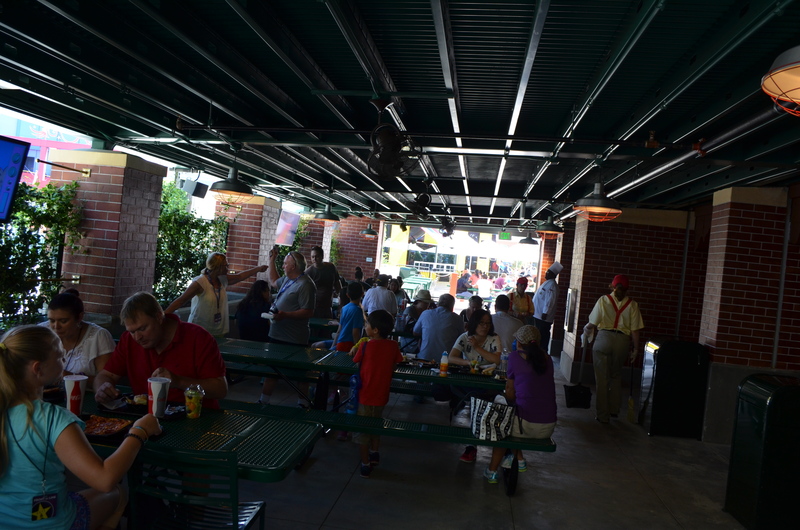 The beer garden is lovely, but is quite small. 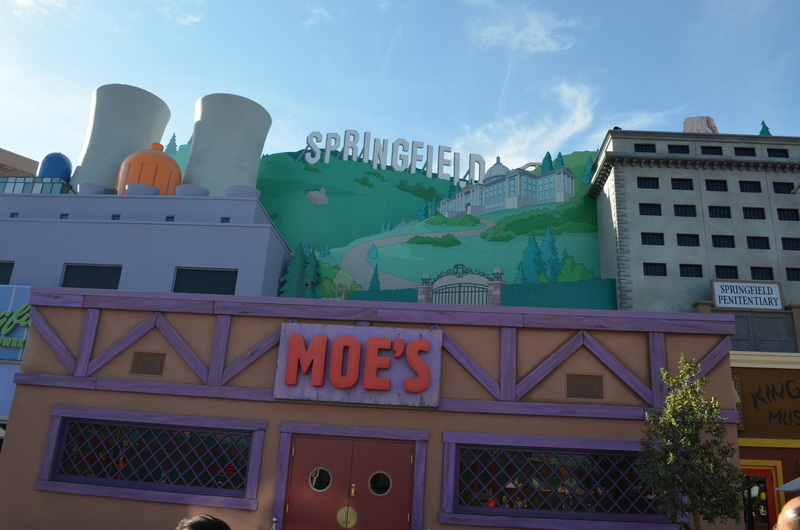 Springfield is very immersive and you can go get a meal and visit your favorite Simpson’s locations. 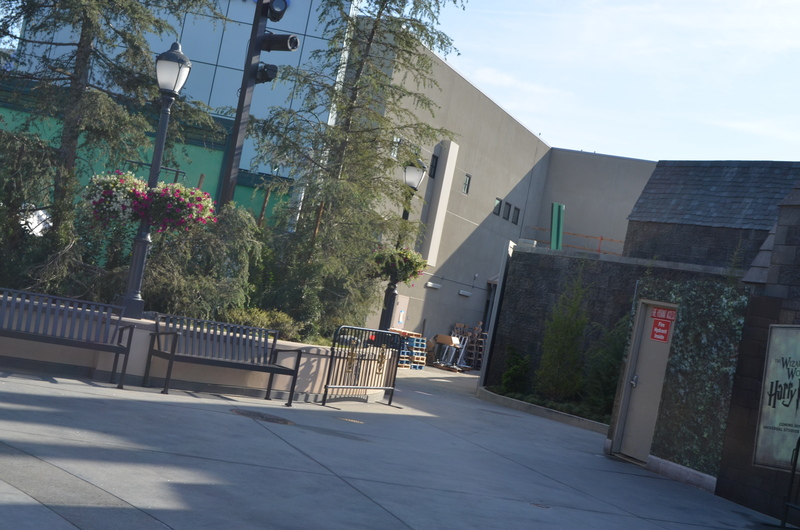 The land also does an effective job at hiding the roofs and chimneys of the Wizarding World of Harry Potter. 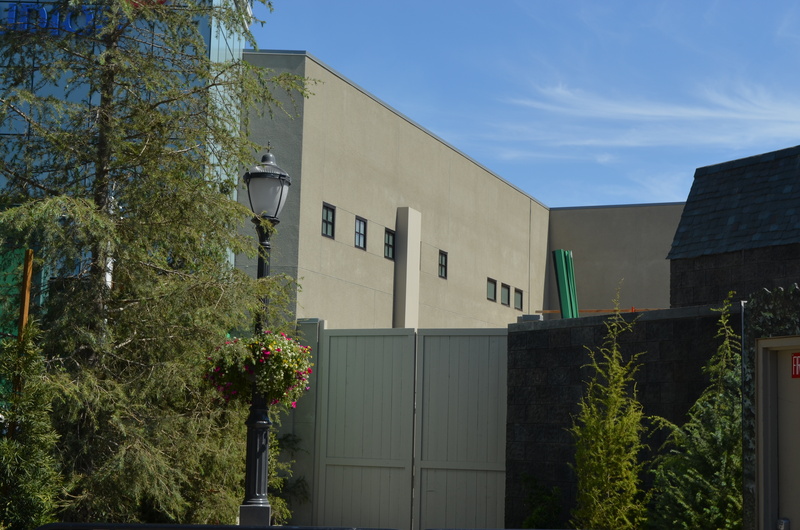 Unfortunately, as you walk toward the main entrance of the land, you can clearly see the backside of the building. 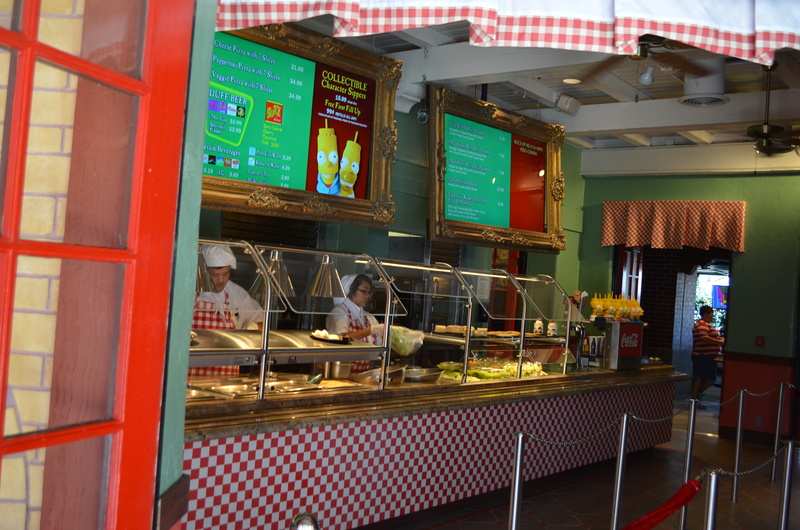 It’s visible all the way from the French Bistro ‘Grab & Go’. 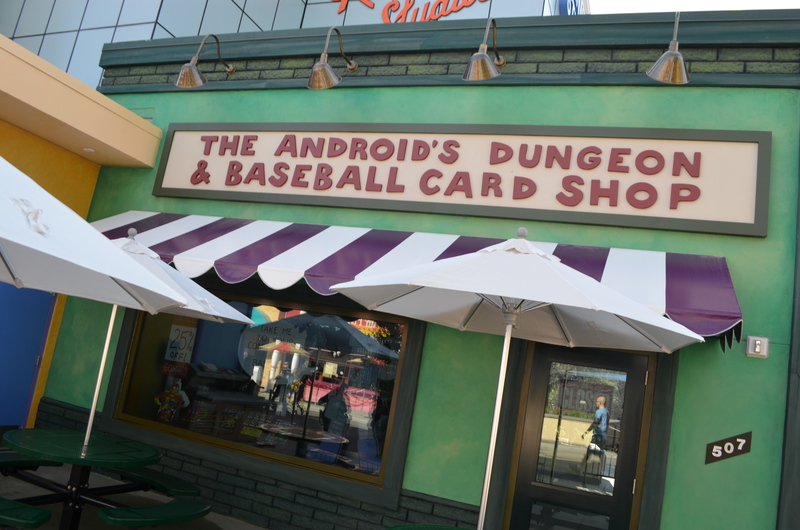 It’s absolutely wonderful to see the park get fully themed lands. 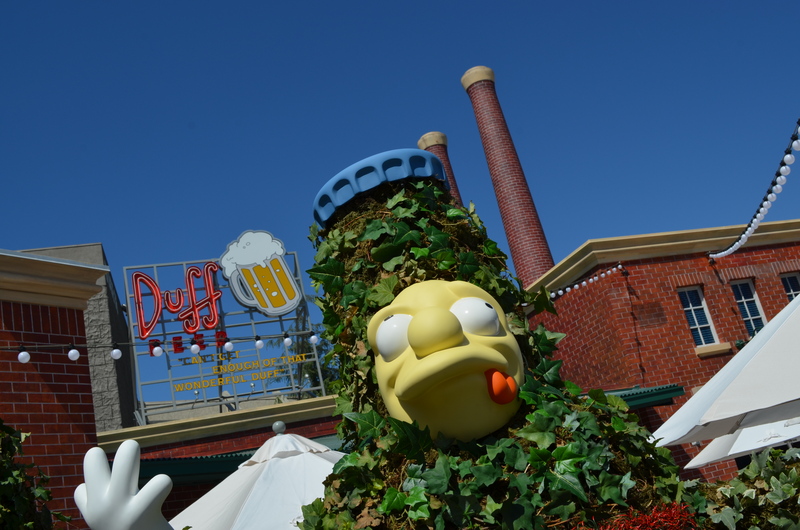 Starting with the park’s new hub, Universal Plaza, then Super Silly Fun Land with Despicable Me, and now Springfield, with Harry Potter coming next year. 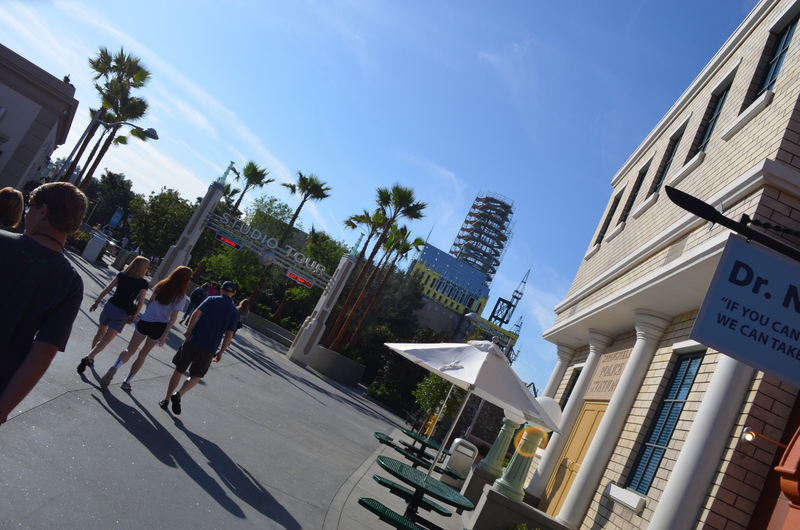 The park is currently undergoing a massive remodel, is sure to be in the headlines later this summer as they will be opening the innovative and cutting edge, Fast and Furious: Supercharged on the Studio Tour. 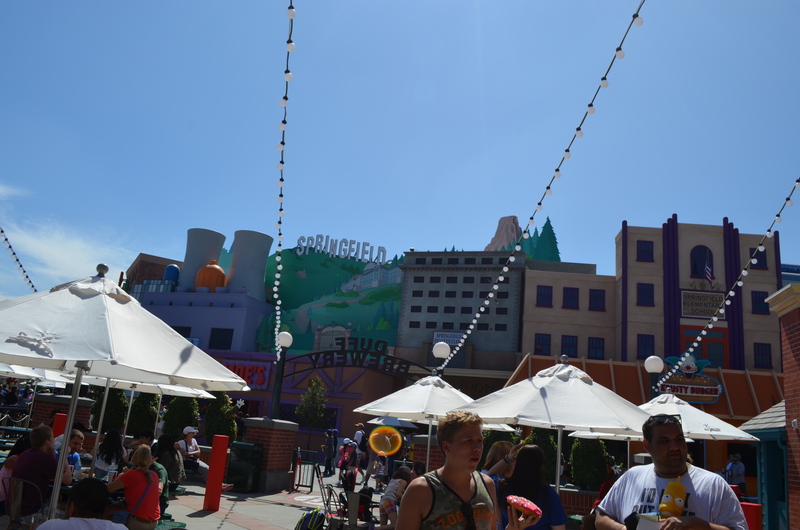 Be sure to visit the park this summer, as it will be their biggest one yet! 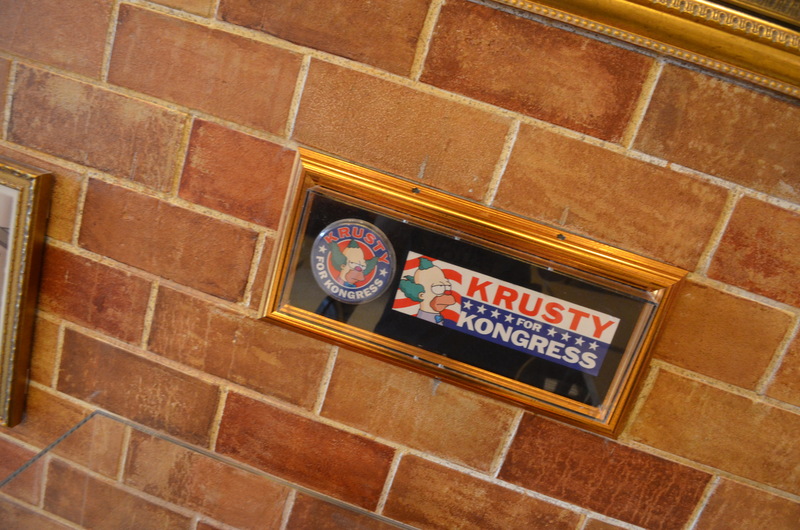 Wonderful photos, Kolby! 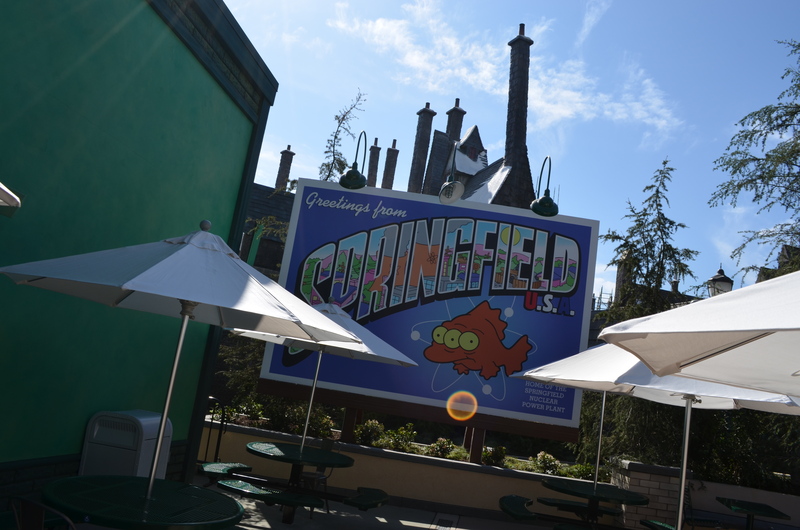 Springfield looks great…..I can’t wait to see it in person. 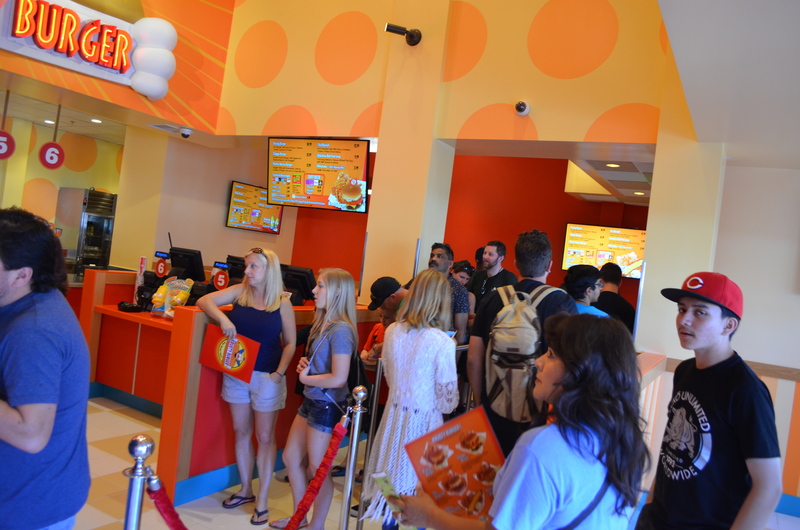 Thanks for the sneak peek!